I still cannot read that name without my brain auto-correcting in the missing "a". I wish they would change the name to something more distinct from Code Academy. i've seen the name dozens of times, i've done a dozen or so lessons on their site to try it out, i've told people about it, and this is first i've realized this. I think if anyone were to change name, it'd be the real Code Academy now. About 90% of times I encounter anyone trying to say Codecademy, they say 'Code Academy' and don't believe me when I say they're wrong and that there's another service using that name. That's branding for you.. and they've won the battle. They also appear to have won the Google battle - the first result for "code academy" (with or without quotes) is Codecademy. Codecademy has far more links than code academy (.org) so that's not surprising - also, redirecting CodeAcademy.com may be helping them out. I'm not an SEO expert, but I believe the way it works is persons/entities/companies bid on keywords through Google Adwords. If they win the bid, their site will pop up first or closer to the top. I always thought Codecademy.com and Codeacademy.org were the same company or at the very least sister companies; somehow related. > I'm not an SEO expert, but I believe the way it works is persons/entities/companies bid on keywords through Google Adwords. If they win the bid, their site will pop up first or closer to the top. I think dandelany meant organic results, not sponsored links. In any case, I didn't receive any ads for "code academy" on Google, so Codecademy's ranking is natural. actually you can just type codeacademy.com with the a. There is auto redirect to the one without the a. It doesn't change the fact that there is already a Code Academy (.org) in chicago or that when I do a Google search, I have to purposely put in a negative keyword for codecademy for it to accurately get Code Academy, which people end up mixing up anyway. I genuinely believe the name to be Codecademy and not Code Academy. But overall I wish they'd just change the name period lol. Whenever I pronounce it, I just say, "Code Cademy, without the 'a'." this is the correct pronunciation. Which helped further train my brain on the wrong name, as that's exactly what I've been typing in for a while now. I get to the right site, but I continue to call their service the wrong name to everyone I talk about it with. I tend to read it as "Co-Deck-A-Demy"
So from what I understand Codecademy's long term monetization plans seem to be focused on being a middle man between new programmers and companies looking to hire . Have you looked at the Code Year track? The last challenge before the start of the Python course and following a flurry of jQuery challenges is a project aimed at demonstrating programming prowess attained up until that point . It seems like the perfect place to start to "build a portfolio" as you say. It's also at a great point in the track since people should be very comfortable with a stack like html/css, js, jQuery. It's easy for us experienced folk to say "forget that rubbish, build a portfolio" but that argument quickly falls apart in the context of teaching people who have no idea what programming even is and who want to explore it more. As much as I would love to have sat down at the age of 14, looked at a computer, and started pumping out concurrent, distributed Ruby web servers, it doesn't happen that way. You really do have to start from the basics, poking and prodding, until you can actually build anything worthwhile. I haven't and that is great to know. I guess that was part of my question: How does Codecademy attack the balance that hiring companies want to see when it comes to technical knowledge and experience building real things. The original link points to a non-official course that is still in beta testing. Is the site broken currently? I can't see the actual exercise. Nope, it's up. What browser are you using? Same problem here, with Opera 12 and IE9. Edit: Got it to work, it was the firewall blocking something. Glad to hear it; thanks for circling back. what_ever, were you able to have better luck later? Ah, we do have a firewall at work which is pretty aggressive. Didn't get time to check it out yesterday at home. Will do so today. Thanks. I've been increasing my intention to learn Python for awhile now, this may just lower the barrier enough to be my tipping point. Is that like "reducing the duration of my procrastination"
Yes :) How about "increasing the priority of this spare-time goal relative to other spare-time goals"
It would be similar, but he hasn't quite yet reduced the duration. Hopefully he will soon. I have to agree there. I got to a certain point and quit because I had to go to the help forums for each question. There are certain problems that only accept one solution even though there are multiple paths. For example, the isOdd and !isEven problem. I wrote down isEven and !isOdd, but it would only accept the opposite of that. Same result, but only one gets you a passing grade. I thought I left the guessing what the teacher was looking for behind when I finished college philosophy. we hope you'll give the python courses a shot - they're edited and should be great to learn from. I just finished Udacity's CS101 (Python). I've been thinking of taking a few more Udacity courses. Anyone with experience with both -- Udacity and Codecademy -- recommend either one over the other? IMO, Udacity is much more interesting than Codecademy. Codecademy relies too much on exercise repetition. Can you elaborate on your experience with Udacity? I went through Udacity CS212 and thought it was great. I have to say, I already knew some python, so I'm not a total beginner, but it was presented in nice bite sized pieces so you can do a little every day (which is my preferred method of learning). CS101 was great, taught by a CS prof so plenty of basic fundamentals peppered in on top of a mostly practical python course. Doing simultaneously. Udacity has less glitches. Codecademy hangs from time to time. Lots of traffic? Udacity also is longer and has more theory. But.... Given the time and focus, Codecademy will catch up. 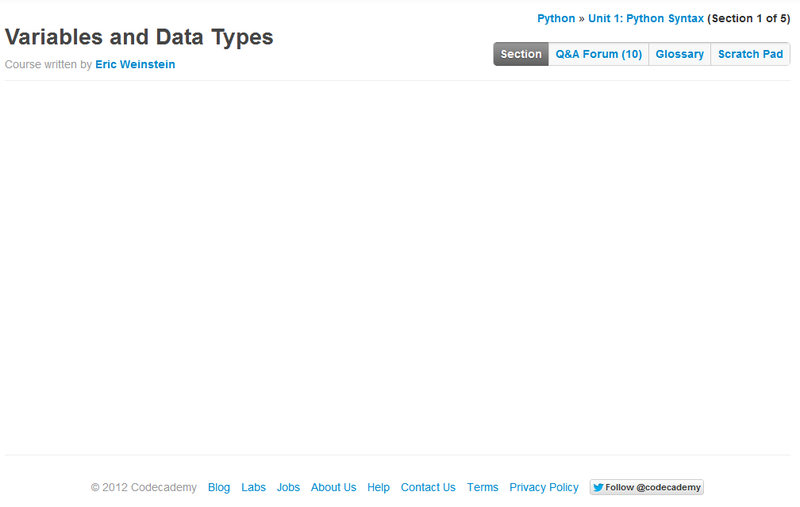 Opening Lesson 1, Variables and Data Types (http://www.codecademy.com/courses/introduction-to-python-6We...) gives me empty content (decorated, but without content inside). EDIT: I'm using Chrome in Win7. Can someone explain how this works? Looks like the page loads socket.io - is Python running in a sandbox on a server? So excited about the Python courses! Enjoy! Only problem is, that I am experiencing an 500 Error, when trying to resume "Taking a Vacation" Pt 2.
we'll look into it - can you shoot an email to contact (at) codecademy (dot) com? thanks! I heart Python. (I'm learning it as my first language). I've already passed much of what they are going through (at least in these introductory lessons), but I am super happy to have another resource to help me learn the language. Thanks for the post! Nice stuff, I've tried to get a few friends to try python and this is a great way to get them started. A bit sad it is only Python 2 though. Some of the stuff thought is not compatible with Python 3. It's buggy in Firefox, so I can't app tab it with the rest of my everyday tabs. A little disappointing, but no biggie. can you email us about the bugs? would love to investigate - contact (at) codecademy (dot) com. Once I got past the first lesson in Chrome, I'm now able to progress in Firefox like I wanted to in the first place.